The Star of David is a Jewish symbol that is well recognized and very traditional, and works beautifully in this Hanukkah menorah made of silver. From the Israeli Judaica artists at Paldinox from their Novell Collection, this chanukia will be a holiday star. Using the traditional Jewish symbol of the Star of David, Paldinox has created for its Novell Collection this stunning silver Hanukkah menorah just in time for the Jewish holiday. This special hanukkia has taken the shape of the Star of David and has opened it up, and twisted it in a modern version of the symbol. The candle holders for each of the eight nights fashioned along are along a long side of the upturned triangle of the star, and the shamash candle holder has been placed on the upper most point of the other triangle at the middle intersection. The body of the candlestick takes the Star of David shape and folds it inside out into a twisted, wing-like shape for a unique modern and fluid look. The base of the hanukkia sweeps out in a flowing skirting shape on four teardrop feet to finish this with a dance motif. This silver menorah for the Hanukkah holiday has been made in Israel and stands 22cm high and is only 16cm at the widest point. 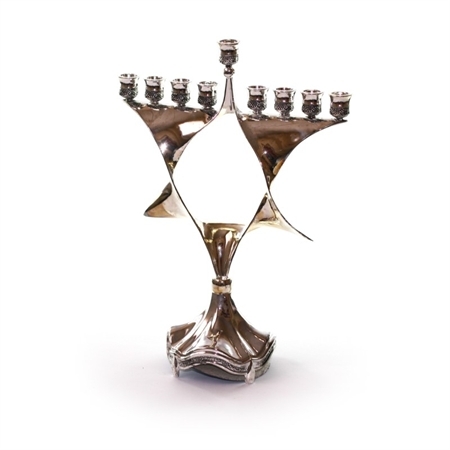 What a special gift of Judaica this menorah will make for the Hanukkah or any time of the year.